At SAPT, we see all kinds of athletes: baseball, softball, football, soccer, volleyball, track and field... the list goes on. We've worked with some of the less-common ones too such as water polo, equestrian, and fencing. (We also have thespians...) Each sport has unique needs and demands and we differentiate those needs as we program for each individual. However, about 80% of an athlete's first couple programs are similar across the board, regardless of sport. Why? Because most of our new athletes need global strength (they're fairly weak), new movement patterns (they move poorly), and rebalancing (they've developed wacky imbalances from playing their sports). More often than not, we need to spend the first 1-2 months (or more...) focusing exclusively on these areas before we can start throwing in more sport-specific training methods. These are basic human movements that, when done properly and under load, will increase athleticism of every athlete. They are the foundation of all athletics; these movements make people stronger and more functional than all the bosu ball and agility ladder drills combined. Individualized programming can take a while. So, to save time, we write program templates that cover the basic movements for every new athlete that walks in our facility. We have at least 3 waves of program templates for every sport that we come across. Like I mentioned about 80% of it consists of those basic movements and the other 20% are a bit more sport-specific. For example, we'll have shoulder care drills programmed for our baseball players and jump technique work for our volleyball players. The great thing about templates is I can program all the basic movements under a broad category umbrella for example "goblet squat," and then I can pick and choose the variation that is most appropriate for a particular athlete. Let's say I have a 15 year old soccer player who has a hard time keeping her knees out, I can choose a goblet squat variation that will tailor to that, for example, goblet squat with bands at knees. I can use that same template for another soccer player who needs more of a challenge so I can choose an ISO hold or slow eccentric variation. 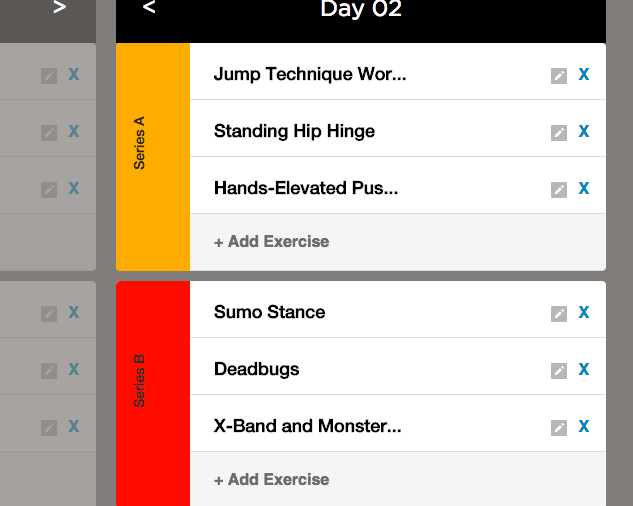 I can use templates to save time puzzling out what exercise I want where and I'm able to customize their programs with just a few clicks of the mouse. To sum it up, all athletes need the ability to perform the foundational movements (squat, hinge, push, row). If they can't do these, and do them well under load, then they have no business getting "fancy." Older PostSAPT Contests through 4/12/15!